A couple nights ago, on a whim, I decided to use two my five free days to give away Apocalypse, curious to see how many copies would be downloaded without any other form of promotion. The result is, more people have my writing in their hands from two days than over my entire life. It’s kind of weird. What’s crazy is there are a bunch of blogs where you can upload your book, and they’ll feature it for thousands of people on your free days. I did not use any of these blogs (though I did for Night of the Necromancer, which is due to go free next weekend), so if I had used them, the total downloads might have been a lot higher. I may have even broken the top 100. Exhibit B: This next one is me at #80 on the Genre Fiction list. 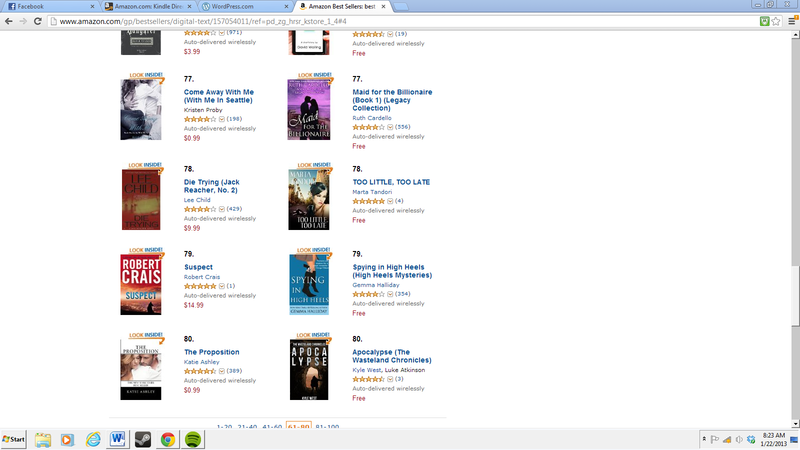 The funniest part about this list is I was pretty much the only book that was not romance/erotica…lol. 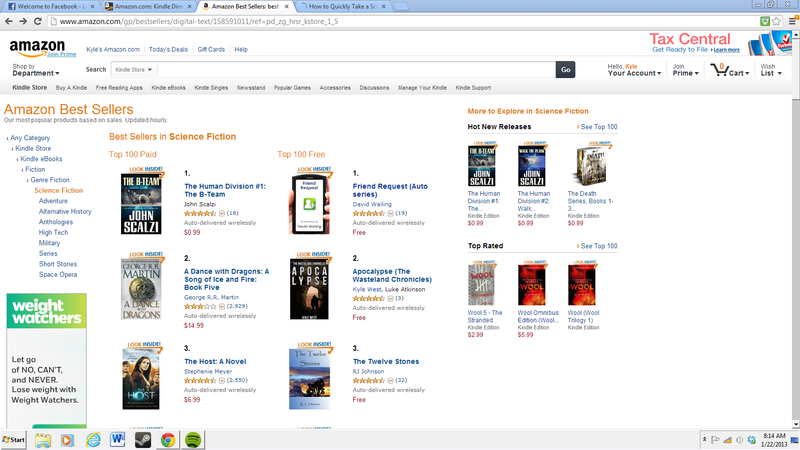 I was holding my breath to make the Kindle Top 100 Free, but it didn’t end up happening. Perhaps some day, and I feel like I could have made it if I had let blogs know a few weeks in advance I was going free. But, like I said, I did this on a whim out of curiosity. What I learned is, when you have a popular genre, a great cover, and a short and to the point blurb, as well as a well-formatted and intriguing sample, your book is very likely to be downloaded if it goes free. I’m sure lots of reviews and likes help as well, but my book is new and has had any exposure yet (I guess until now). Or, it could have just been luck. There were thousands upon thousands of books that were free at the same time as mine, yet somehow mine climbed its way close to the top of the heap. All in all, not a bad run. It felt pretty good to get so high on those lists, and to refresh my page every second to see all the downloads. The only thing is, I don’t know how many will actually read the book, because I’m sure a lot of people are just like “FREE!” and they get it, and never read it. I know I have about 5 free books queued up myself, that I keep telling myself I’ll read someday. Also, if everyone had actually bought those books, I would have made about $4,500. Really, this wasn’t money “lost” per se, because none of these people likely would have downloaded my book anyway, much less have seen it. All the same, it’s really cool. I have no idea if any of this means anything, so we’ll see if I get a little bump tomorrow from sales or the coming week. The biggest thing I can hope for is that people read the book and like it. Ultimately, I think if you have an entertaining yarn, people will like it, look out for your next thing, or tell others about it. I’m also hoping for some positive reviews, but I recognize there are some things wrong with the book..like the ending being too much of a cliffhanger without enough resolution…but I think ultimately it’s probably the best piece of fiction I’ve written. And I will get better, and am already bursting with ideas for book 2 (but first I want to finish the first book in my new series, Dark Prophecies…hoping to have that one online in mid-Feb at the latest). If anything, five people in Japan have my book now. Whether they read it or not, that’s a cool feeling. Also: to everyone who downloaded my book, THANK YOU! I hope you read it and enjoy it. You should also leave a review on Amazon (preferably glowing, but honest works too!). Double also: As of this edit, the book is still live for another 2 hours and 38 minutes, CST…so go download it! 1. Today I wrote about 6-7,000 thousand words to complete my novella. Total of about 39,000 words. I have no idea whether or not it’s good. I guess I’ll find out when I read it over again and see what needs to be fixed. I have never written a book as fast as I’ve written this one. In a few days, I’m going to go back and start the editing. 2. I’ve heard back from 10 blogs that want to review Night of the Necromancer. I have 10 reviews (some slotted for February/March, 2-3 interviews, and a couple of giveaways is pretty good. It’s only been a couple days, so I may hear back from more. It is amazing to think that 10 blogs will be reviewing my book, some of them overseas. It’s pretty mind blowing, and awesome. These book bloggers are amazing people. 3. Even though it feels like I did a lot today, it still felt slow for some reason. I still need to go through Apocalypse and make sure the changes my professor suggested get implemented throughout. After that, promotion time…and the working on a physical copy with my illustrator, Luke Atkinson. 4. I also need to redo the print version of Night of the Necromancer to keep it updated with the online version. That’s a project for another day, but Apocalypse 2.0 needs to get done. That is the priority number one. As I sit down to do writing stuff, or even book promotion, I really wish it were my full time job. I’ll get there, someday. 5. Speaking of, I got a call from Hobby Lobby. Pending I pass a drug test , I should be starting in the warehouse moving boxes and suchlike things. I’m glad to have a job again. In total, I’ve only been without for a week. I feel incredibly lucky that this worked out. I’m a bad interviewee because I’ll get nervous and talk fast, but I just have to sit through and deal with it. I’m just glad it went alright. Also, my good friend Jon gave me an amazing reference. It just might have clinched the deal. 5. I appeared on a podcast. I listened to The Storyboarders while at work, but since I probably won’t be able to listen to my iPod anymore at work, I’ll have find another time for it. I appear on Episode 13. I talk a little bit about working on Night of the Necromancer with Jelani, as well as a bit about self-promotion, the journey I’ve been learning for the past few weeks or so. 6. Things are good. I’m occupied every moment in something I really enjoy. Starting next week, I’ll most likely be starting my new job. Anyway, that’s all for now. I’m sleepy so sorry if there are weird wording things. It’s been a lot of writing today. The Vexations of a Writer, Avast! Spent the whole day doing promotion stuff. I’m getting better at it! It’s actually kind of excited. I solicited a total of NINETEEN blogs today about my first book, Night of the Necromancer. That was really cool and I’m expecting great things. The vexation comes with the new upload of the book…it’s doing screwy things I didn’t expect to as far as formatting. I’m just going to bite the bullet and try to take care of it, but my beloved chapter headings I worked so hard on are part of the problem and have to go. Avast, indeed. Seems like there’s always work to be done if you want to get ahead. Sadly I’m falling back on my running and I’m paying the price. I’ve run once in the past two weeks (and that was only a mile and a half), and I’ve gained FIVE pounds. Oi! I’m going to have to get back on track if I hope to complete this half marathon. I have to get back to work now, so farewell, readers. Wish I didn’t have to go in tomorrow because I could do so much with the day, but I need the money. All in all, a VERY productive day/weekend. Hardly relaxed the whole time, but it is a good kind of work that I feel like will advance things. Time well spent. Thanks for reading! Also, new season of Downton. Huzzah!